I’ve been making zucchini patties for the last few years as a way of using up my excess zucchini, but the recipe I’ve been using up until last summer (when I was vegetarian, not vegan) has both eggs and feta cheese in it. But I love these patties so much that I have been wanting to recreate a vegan version. To be honest I was worried I’d end up with something awful, but I haven’t, they are yummy. 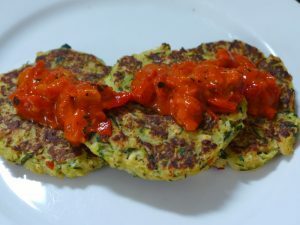 But if I am completely honest, I now prefer my accidental asian flavoured zucchini patties that I posted recently. Anyway, back to these patties. The fetta is replaced with some marinated tofu made using this brilliant recipe from Bryanna Clark Grogan, but you can also use a ready made bought tofu feta. The eggs are replaced with the ever useful chickpea or mung bean flour. I love to eat these with some ajvar – a Balkan red pepper relish and salad. I currently buy ajvar from an old Serbian couple who run a local deli, but I will try making my own soon when the capsicums in the garden ripen. Rinse the tofu feta under water. It is vitally important that you wash the miso marinade from the tofu 'feta'. If you do not it will be inedibly salty. I forgot to do this on the first batch I made!